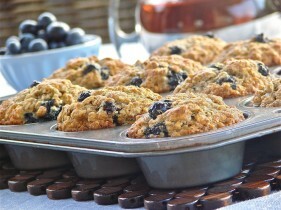 You’ll be blown away by the great taste and moist texture of these banana-blueberry muffins! Flavor explosion! Ka-pow! Preheat oven to 375°F. Spray a 12-cup muffin tin with cooking spray and set aside. Combine oats, both flours, sugar, ground flaxseed, baking powder, baking soda and salt in a large bowl. Mix well and set aside. In a medium bowl, whisk together bananas, butter and egg. Add banana mixture to dry ingredients and stir just until dry ingredients are moistened. Gently fold in blueberries. Divide batter among 12 muffin cups. Bake for 20 minutes, or until a wooden pick inserted in the center comes out clean. Cool on a wire rack.